We’re in the midst of strawberry season, that blessed time of year when you can buy strawberries from local farmers that actually taste like strawberries. Imagine that! Those berries are so sweet and juicy, you can enjoy them just as they are. But if you want to dress them up just a little, try fragole al vino rosso or Strawberries in Red Wine, tossed in sugar and lemon juice in typical Italian fashion as you would for a fruit salad, and then macerated in red wine. The sugar and lemon intensify the strawberry flavor; the wine provides its own delicious complement. While this simple dessert is at its best with seasonal strawberries, it’s also a fine way to coax some flavor out to those insipid, over-sized mass-produced strawberries you’re likely to find in your supermarket. Rinse the strawberries quickly under cold running water. Shake dry, then trim off the stems. If very large (as supermarket strawberries tend to be) cut them into halves or quarters and place in a large mixing bowl. Dust the strawberries with sugar and toss the bowl until they are lightly coated, then squeeze the lemon juice on top, together with a few drops of Cointreau if using. Toss the bowl again, then leave the strawberries to rest for a few minutes, until the sugar has melted and the strawberries glisten. Add enough wine to the bowl to just cover the berries. Let rest for a good hour or so, or longer if you like. If macerating for a long period, put them in the fridge, and take them out at least 30 minutes before serving. Taste and adjust for sugar about halfway through maceration. Serve at room temperature or just slightly chilled, with a sprig of mint for color if you like. Needless to say, this is a simple recipe. But it’s not without its subtleties. The key to success is balance, in particular balancing sweet and tart flavors to get a result that pleases you. Obviously, if you have a sweet tooth, you can add more sugar. But exactly how much you’ll want to add depends on your other ingredients. 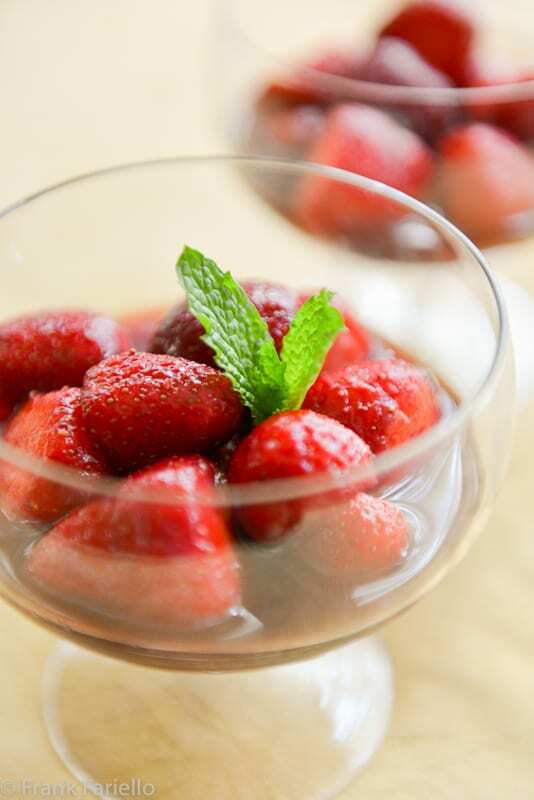 Strawberries can range from sweet and juicy to rather firm and tart, while wines, of course, run the gamut from sweet dessert wines to rather acidic. You can adjust the amounts of sugar to compensate. You can also cut back a bit on the lemon juice if your strawberries or wine are especially tart. Texture, too, plays a role in making a perfect rendition of fragole in vino rosso. Beautifully ripe strawberries can be quite soft. They can get minimal maceration: just a few minutes in sugar and lemon, then an hour perhaps in the wine, as indicated in the recipe above. But if you’re working with the typical mass-produced variety, your strawberries are likely to be quite firm and bland. I would be give them more time for the initial maceration in sugar and lemon, being generous with both ingredients, until they have softened, and only then macerate them in the wine. And tossing the strawberries—as opposed to mixing them with a spoon or spatula—is particularly important if you’re using fresh, ripe strawberries, the kind you may be lucky enough to find in your local farmer’s market. Those strawberries can be quite delicate and tossing ensures you won’t bruise them too much. You can also vary the maceration times to suit your taste. I’ve seen recipes calling for anything between an hour to overnight maceration. Personally, I think the berries hit the ‘sweet spot’ after about an hour. More than that and they lose their fresh taste and begin to turn mushy. At least, that’s my opinion. That said, if you’re using supermarket strawberries, as mentioned, you might want to leave them to macerate longer. Some recipes for fragole al vino rosso leave out the lemon juice altogether, but I wouldn’t recommend it. A little acidity helps balance the flavors as described above, and it’s essential to the maceration process. As a less acidic alternative, try the juice of an orange instead. In the summer, the same technique works beautifully with stone fruits like peaches. Strawberries sometimes need a little help to bring out their sweetness and the combination of sugar, lemon and red wine is a great way of doing so. A perfect way to end a meal. Simplicity with style. I perfect combination for our lovely fresh berries now at the market. The addition of the Cointreau and mint leaves, nice touch. Wonderful, Frank. I love to serve local, in-season strawberries this way. I have to say, though, my methods are far cruder than yours. I love the subtleties you make use of. This is the perfect example of why I love Italian cuisine, take the best possible ingredients and combine with few other complimentary and high quality ingredients — the perfect dessert to showcase fresh local strawberries. Our berries will be at the markets in mid-late June, we started with a hot humid spring but the last few days as been as nippy as a fresh fall day. Not that I mind, the humidity can get to me. You have the most beautiful recipes Frank! I love the simplicity of all your recipes with beautiful photos too. This is a lovely summery light dessert. Ok, I’m totally making this recipe (and soon), Frank! We have some wine arriving this week that we sent back from our winery stops in Italy, and I’m thinking this would be an excellent way to enjoy some of it. 🙂 Such a fun idea!! Certainly would be, David. Enjoy! Like Domenica, I enjoy peaches in red wine, but never tried it with strawberries. Now is the time, before we have to resort to only those tasteless supermarket berries again! Yep, we’ll all have to act fast before the season ends! This is a wonderful recipe Frank and I will make it. Could I serve it with some whipped cream. It’s a German thing! I do love strawberries with whipped cream, too! Personally I don’t think it goes in this dish, unless you’re using a sweet wine, but why not try it and see if you like it? And I’ll be interested to try yours, Paola. It sounds wonderful. I’m looking forward to trying this dessert. Can you please tell me what q.b. means? There’s a hyperlink that explains. Click on the phrase (or here) and you’ll be taken to an article on the Italian system of measurements. But long story short, it means “quanto basta”, which loosely translates either as “to taste” or “use as much as you need”. Here I’m saying use as much wine as you’ll need to cover the berries. Lovely. And you’re so right about the those “that actually taste like strawberries.” I was recently in a grocery, which was selling locally grown ones alongside the huge industrially grown ones. I wanted to scream when I saw people in the checkout line with the California ones. Tanti anni fa anni fa l’attore italiano Ugo Tognazzi in un suo libro di ricette(era veramente un grande gourmet oltre che un bravo attore) suggeriva di versare qualche goccia di semplice aceto sulle fragole zuccherate e di mescolare bene. Fu un successo !Da quel momento tanti ristoranti la misero nel menù e la versione con il vino rosso venne qualche tempo dopo. One of my favorite summer treats is sliced peaches in red wine, but I’ve never tried it with strawberries but it makes sense. Thanks for the inspiration, Frank. Enjoy, Domenica! I like this as much as the peaches, hope you do, too! I’ve never had strawberries in red wine! Wow, I love it, though, sounds wonderful! FYI: I’ll be MIA for a month as I’m off to Italia e la Svizzera! 🙂 Will catch up when I return! Have a great trip. Looking forward to your posts, I’m sure the photos will be fabulous as always. With Cointreau for me, please. And mint (we have it running wild in our garden!). Wonderful recipe — simple yet so nice. Thanks! Thanks for your comment! And, by the way, I know what it is to have mint running wild. Once it gets started it’s hard to stop! So simple and perfect for the season…. since the heat has arrived over here ( and plans to stay) this is ideal; mi piace molto. Grazie milla ! I always think of strawberries in red wine as a French dish, as that is where I used to have this dish. And we reserve peaches in red wine as our Italian tradition. But, should there be more strawberries at the market tomorrow, we will be having strawberries in red wine following our risotto with porcini! Doesn’t surprise me that the French “do” this dish, although personally I haven’t come across it there. It’s such a great combination, I’m sure a number of cultures have come up with. Out of curiosity, I did a little Google search for “fraises au vin rouge”. The results were interesting. The recipes I found had you simmer the wine with sugar and spices, then pour it over the strawberries after it cools off. Different approach but I’m sure quite good, too. Beautiful. It’s funny – my mother, who isn’t Italian, always made strawberries in wine. And as usual, I couldn’t handle anything alcoholic. She was always trying to feed us brandies fruits, baba au rum, and so forth. Now I embrace all food alcoholic!